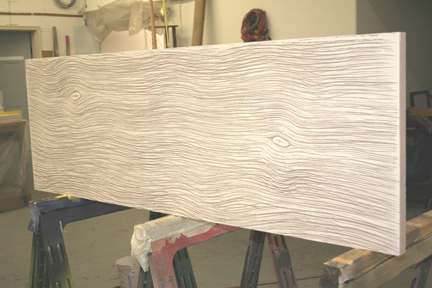 This is a very basic dimensional piece with a wood grain background requested by the architect. 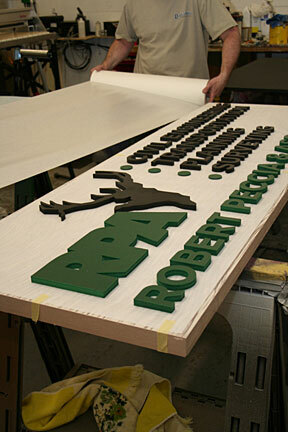 The logo and layout is theirs, not ours, and the logo and all copy will be 1/2" thick sintra laminated to the surface. A perfect example for shops who have never done this before. Step 1: Mist both the substrate and PrecisionBoard with water. 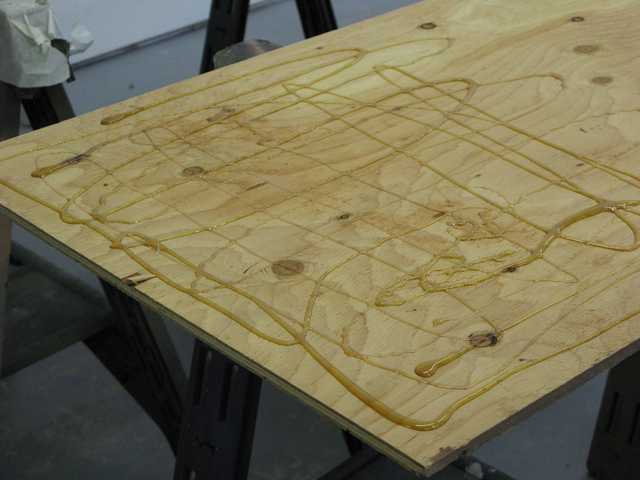 Steps 3 Use a piece of Dibond or whatever to spread a thin coat all the way out to the edges. 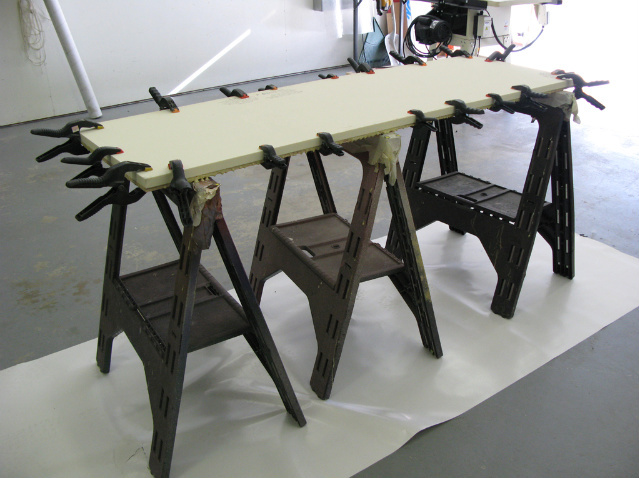 Step 4: Clamp tightly and make sure that you cover the floor under the sawhorses with carrier paper. Clamp it well! 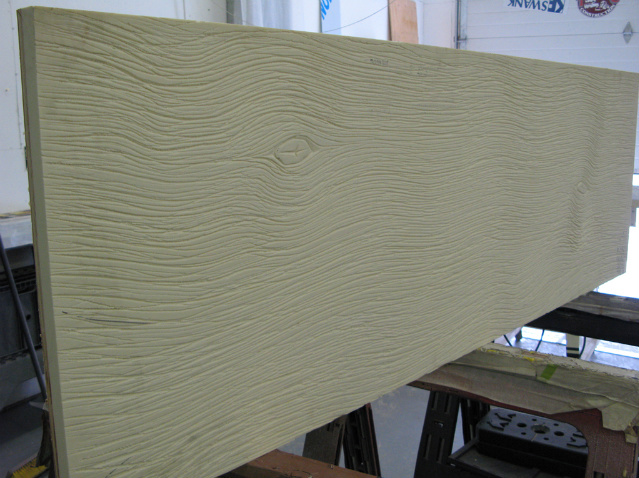 Step 5: Wood graining comes next. 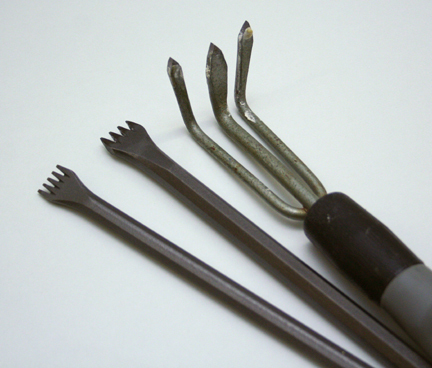 The only three tools you'll need unless you're creating knotholes, then you'll need to add a veining chisel. Keep a vacuum nearby. 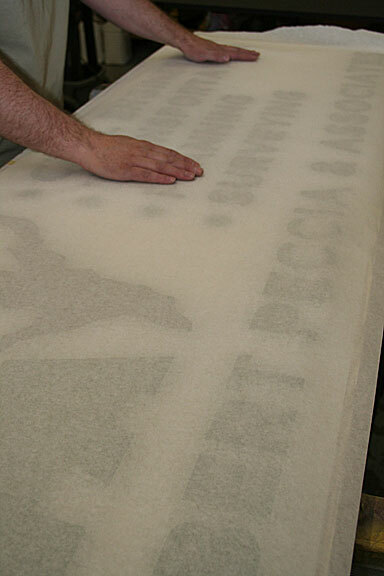 Don't sweep the particles.... Vacuum them! Hold the three tined venire as shown. This allows you to regulate down pressure on the tool. Always begin level, apply pressure, ease down into the PrecisionBoard and ease up the pressure at the end of the stroke. If you need a few marker guide lines, do it. We usually don't. 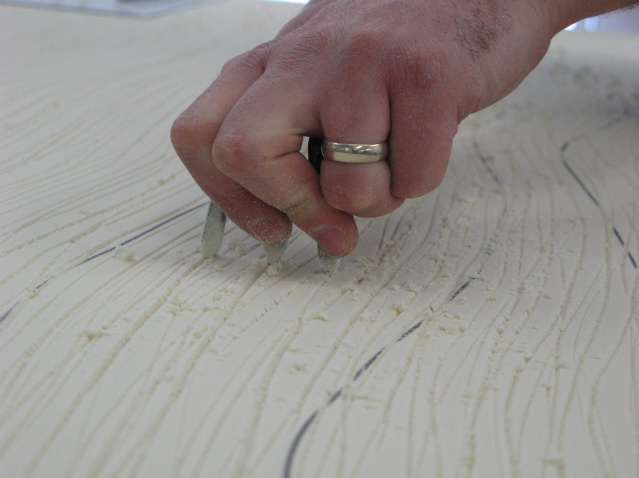 Latigo also uses this method for control... gripping the tined veining tool at the front. 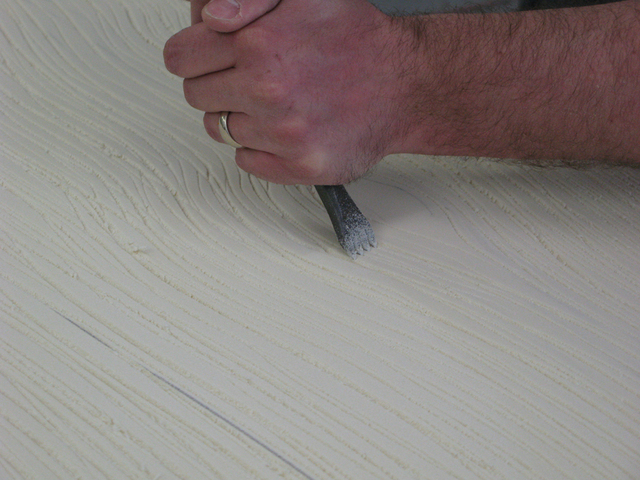 Using the mid-sized stone carving tool, use both hands. One to hold, one to apply pressure. Simple knotholes will come later. This tool makes the finer, more controllable lines. 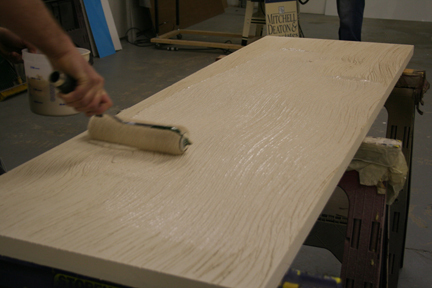 Use your small veining chisel to form a knothole. Lat did a very simple one here. 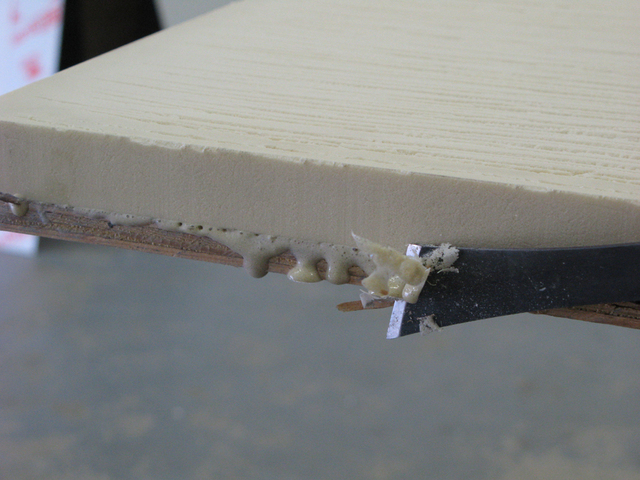 Step 6: Use a flat chisel to remove the PB240 overflow from one edge. 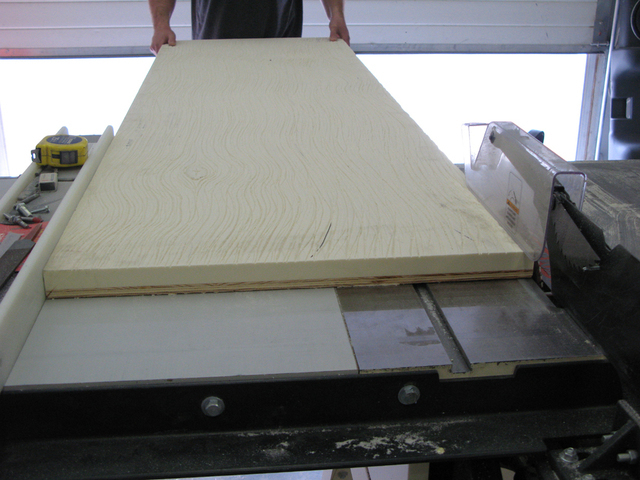 Pass all four edges through a saw to remove the excess PB240 or sand it off. 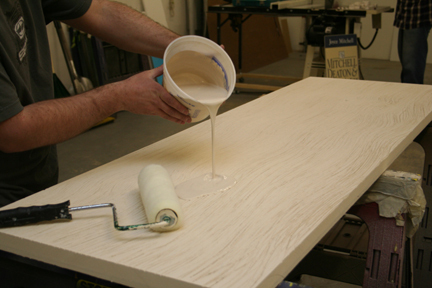 The wood graining effect will become much stronger with the stain or paint process. 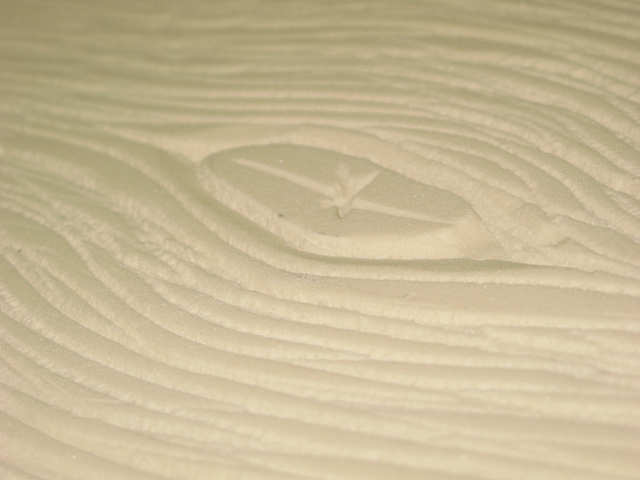 If you want a stronger, rougher effect, keep passing your veining tools through the same veins you've already cut. Step 6: Use a brush to prime if it's to be painted. 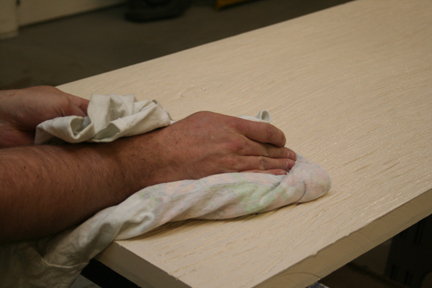 If it's to be stained, DO NOT PRIME the face, just the sides and back. 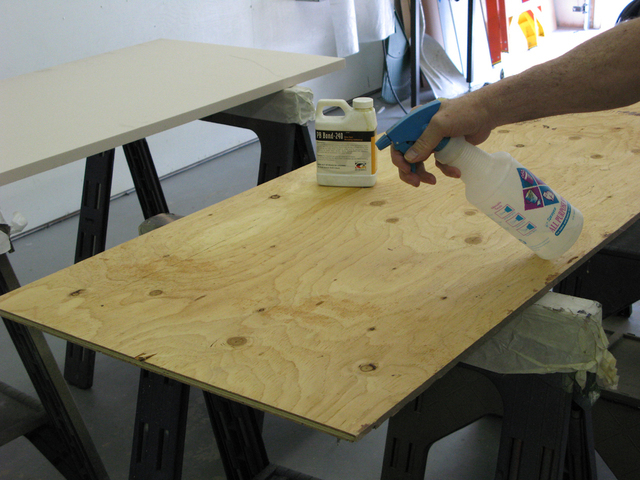 If your shop has no air flow or evacuation system, do NOT use oil based paints or stains. 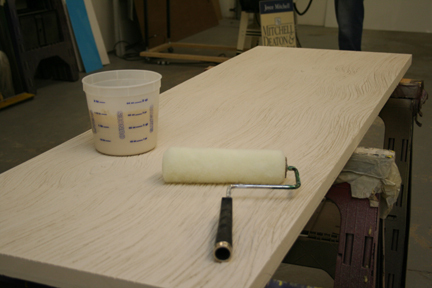 Step 7: With the primer cured and the top coat color selected and cured, (in this case, a light beige) we now apply the slightly darker grain color. 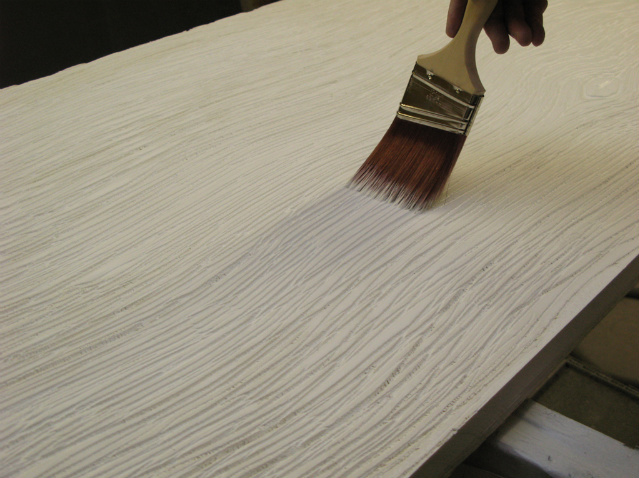 The paint is mixed very thin so it flows into the grain and remains wet long enough to wipe the slightly darker color from the surface. 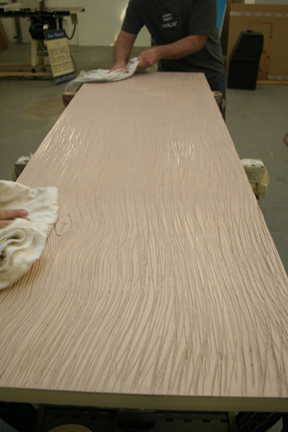 The paint flooded into the grain as having cured darker than the topcoat. 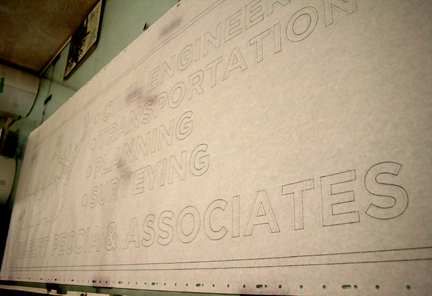 Step 8: Pattern and dimensional copy application is next. Make an ink pattern in real size. 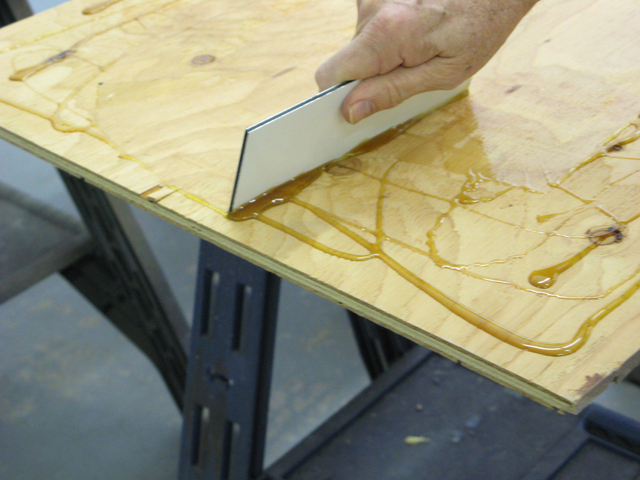 Lay the pattern on the surface of the panel and tape in place. 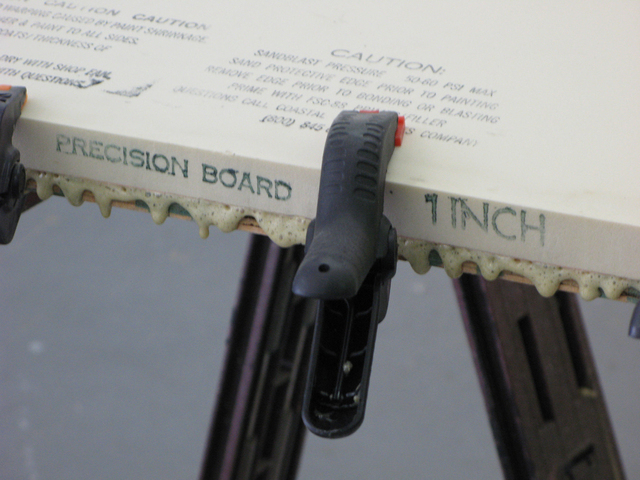 You're going to be using a marker to show hole drilling placement for screws from the back side of the panel. 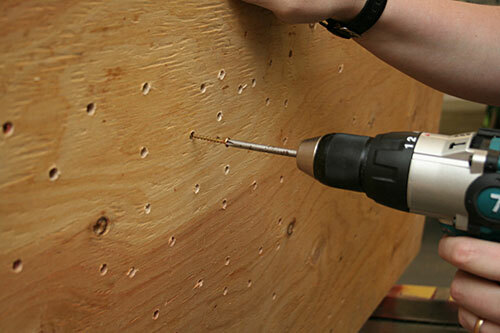 Step 9: Drill through the entire panel. 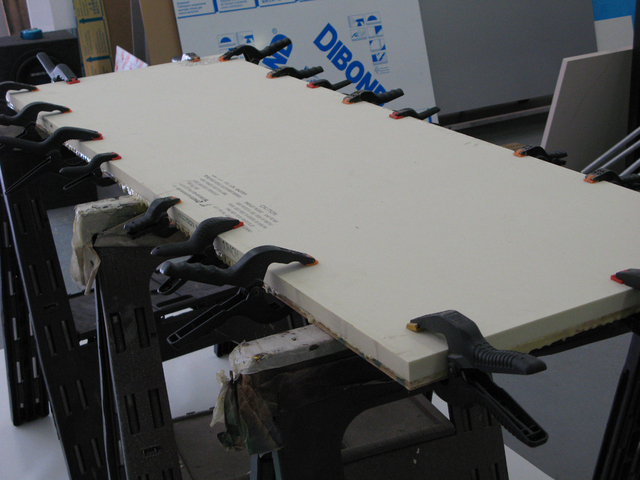 Flip the panel over and counter sink for the screw heads. 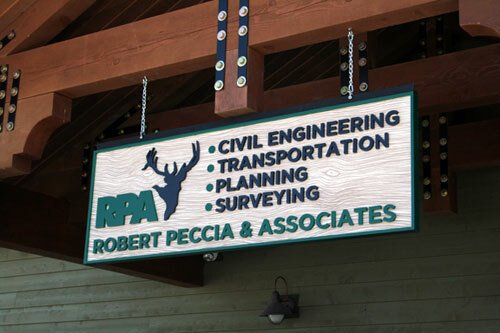 We don't want screw heads protruding above the level of the wood. 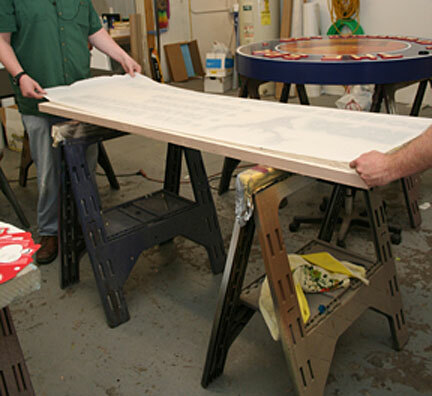 Step 10: Next, we'll be positioning and installing the copy....... just a bit later this morning. Carefully, premask entire copy...Two of you, count three and set it straight down, releasing simultaneously so as not to disturb copy position. Gently (with your fingertips) push premask down on the surface of each character. Gently! Don't shift the characters. 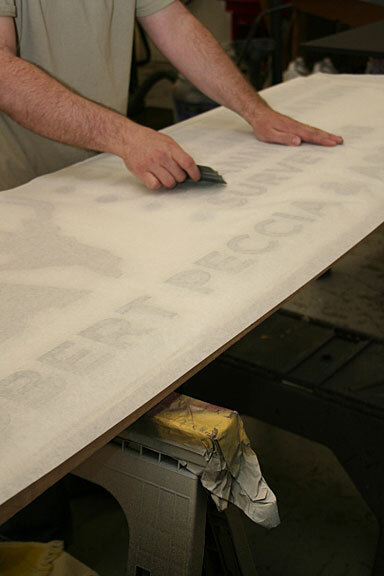 Now squeegee the characters tightly. Use VHB or a "small" dot of PB240 on the back of each character.. less PB240 is better.... VHB is less messy and faster. 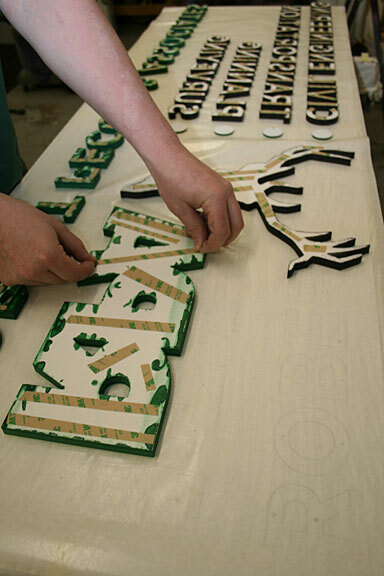 Remove the cover line from the VHB, turn the whole thing right side up on the wood grained surface, push down on the copy to seat it, run the screws through the back into the sintra copy... The VHB or PB240 simply holds it in place while you run the screws. If you use PB240 leave it to cure overnight. 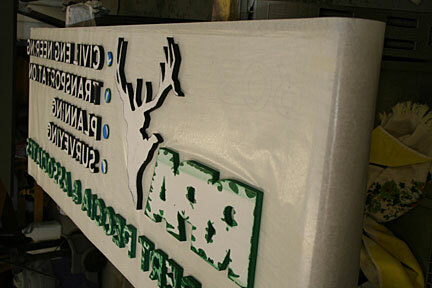 and the final step will be clear coating with the two part Glisten PC, or leave it as is. Florescent lights, so the true color doesn't show here. 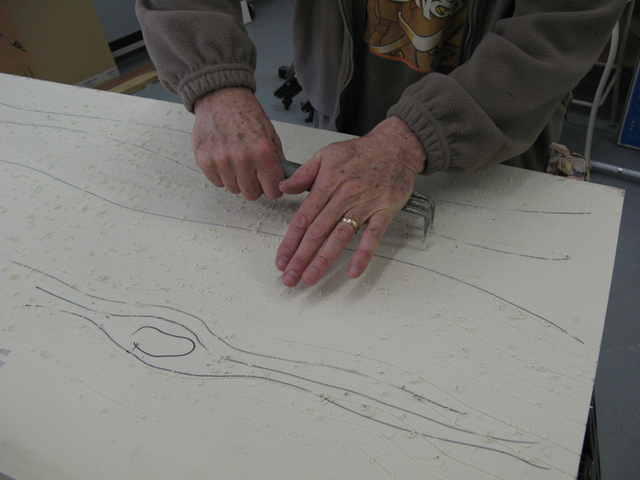 This is a piece that anyone can do without having specialized equipment. 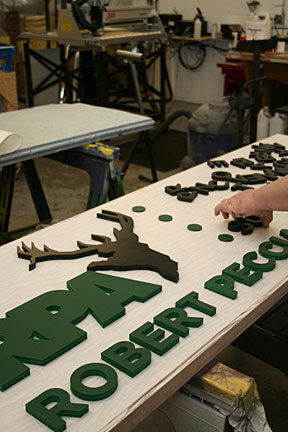 After wood graining if you don't want to cut out the letters you can simply use letters premade from Gemini and install them as shown. Step 12: With the steel, this is actually a rather heavy one, so.....How are we going to safely hang it? Its important that whatever hanging mechanism you use be centered in the carving. 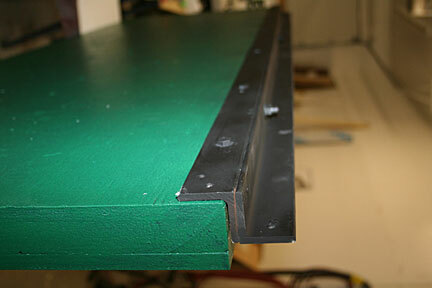 In this case we used full length angle steel. 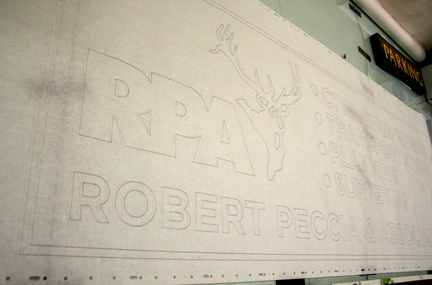 Relatively quick, uncomplicated, no sandblasting and minimal equipment required. The perfect method to add to the vinyl jockey's portfolio.